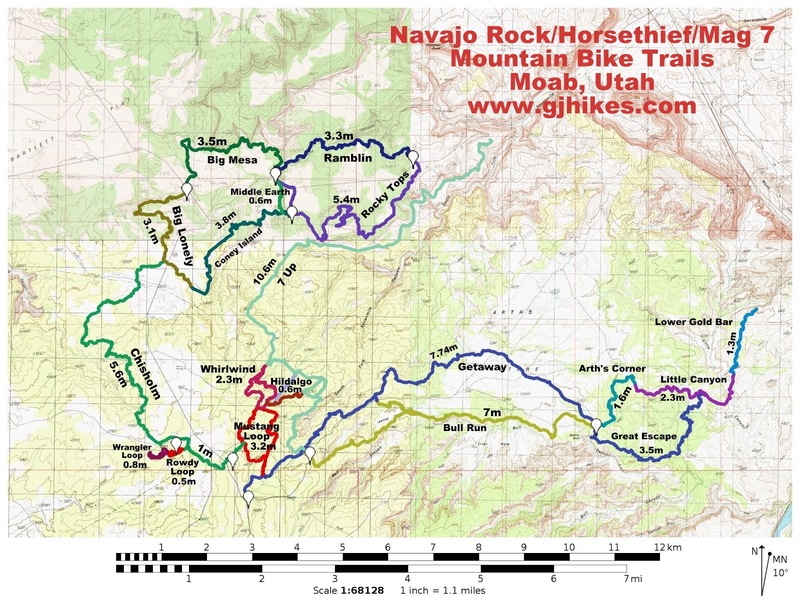 The Chisholm trail is located in the Horsethief Mountain Biking Area near Moab, Utah. 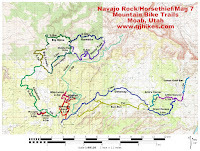 This post covers the newest section of the trail that connects the Horsethief with the Navajo Rocks Mountain Biking Trails. The trail begins at the West Horsethief trailhead near the BLM's Horsethief Campground. From there it works its way northward across sagebrush flats and through pinions and junipers taking a fun route along various canyon rims and washes until it comes to an end at the Big Lonely trail that is part of the Navajo Rocks Mountain Biking Area. To get to the trailhead from Moab drive about 9 miles north on Highway 191 and turn west onto Highway 313 towards Dead Horse Point State Park and Canyonlands National Park. Follow Highway 313 for about 12 miles and turn onto the dirt road that leads to the Horsethief Campground. The trailhead will be on the left after 600 feet. The Chisholm trail, like most all of the mountain bike trails in the Moab area, is well signed and marked making route finding and planning an easier task. The trail starts out by crossing the road and then paralleling it as it heads toward the campground. Near the half mile point it reaches a spur that runs back across the road to the campground. From there the trail turns north where it takes a fast route across the flats. It isn't long before the trail finds the head of a canyon that it wraps around on its slickrock rim. It seems that the trail builders managed to masterfully take advantage of every interesting feature of the landscape to create a fun route to follow. No good ledge goes unused. Even with its occasional rocky features the trail never seems to get above the intermediate skill level although beginners should be able to handle most of it easy enough. As the trail gets closer to Hell Roaring Canyon it begins cutting across the open flats toward the Big Lonely. Enroute it crosses the road that leads to Jewel Tibbetts Arch. After crossing the road leading to the arch the trail works its way to the top of a rocky hill where it meets up with the Big Lonely trail and comes to an end. There are several interesting routes that you could take from here to get back to the trailhead besides just going back the way that you came. That is where the maps come in handy. When we first heard that they wanted to make a trail to connect the Navajo Rocks and Horsethief areas we imagined something a lot less interesting that simply covered the distance along the side of the highway. It's a good thing those that designed the trail had something entirely different in mind and managed to come up with the excellent singletrack that makes up the Chisholm trail. If you would like to see it for yourself then all you have to do is 'Take a hike'.